Most of us that live in this beautiful and remote part of Northwest Montana in Lincoln and Sanders Counties know that our region is rather different than much of the rest of the state of Montana. The biggest comment I often hear from those who are visiting during the winter months or those who relocate to the area is how surprised they are at how cloudy conditions are generally between late October to mid April. Many of us are simply used to that and appreciate the rare times we do get to see the mountains such as the Coeur d’ Alene’s and Scotchman Peaks in Sanders County or the Cabinet Mountains and Whitefish Range in Lincoln County any time of the year but especially during the winter. Have you ever wondered why we do have so much cloud cover in our part of our magnificent state? Consider this interesting fact about our region. Libby, Montana averages 155 days of sunshine a year and Coeur d’ Alene, Idaho averages 125 days of sunshine a year. (I have included Coeur d’ Alene simply for statistical purposes as we don’t have records for other regions in our area). That means that the other 210 days of the year are either mostly cloudy or cloudy, a rather dull picture overall. Yet it’s this “dullness” that allows our region to have the beautiful and magnificent forests that we would not have if we had a lot more sunshine. Our region is relatively dry with Libby only averaging 17.81 in of precipitation, Troy averaging 24.36 in of precipitation, Heron averaging 33.67 in of precipitation, Trout Creek averaging 28.46 in of precipitation and Eureka averaging 14.44 in of precipitation. Except for the locations in Sanders County of Heron and Trout Creek those precipitation totals are all on the low side and one would think that this would not support the little amount of sunshine for our region. The key here though is when the majority of this precipitation falls along with our latitude at 48.5 degrees north and the terrain. Overall our region sees the majority of it’s precipitation during the fall, winter and spring months when daylight hours are considerably shorter and nights are cool to cold. We are also in a region that is generally in the North Pacific storm track which tends to keep the frequency of systems approaching from the west rather consistent even during the warmer summer months. These systems typically have an abundance of cloud cover both low, mid and high level cloudiness associated with them. In addition, we also are vulnerable to systems that dive southward from Canada, commonly referred to as “Alberta Clippers” which usually have low to mid level cloudiness associated with them. Last, but not least we are also influenced by dynamically induced cloud cover and thunderstorm outbreaks in the summer months from the south, all of which contribute to our abundance of cloud cover for our region. The biggest factor however in our persistent cloudy conditions, especially in the the lower elevations where we reside are valley inversions. Under “normal” conditions, temperatures decrease with altitude while under inversion conditions temperatures actually increase with altitude. The picture below shows the typical set-up for inversion conditions in our part of the country. Mountains on all sides of our valleys in Northwest Montana allow extensive inversions to develop during the fall winter and spring months. Cold air pools on valley bottoms with warmer air aloft with cooler air well above the warm inversion layer. The common set up for inversion conditions to persist in our part of the country occur during the fall, winter and spring months when nights are long allowing cold air to pool in the valleys and not mix effectively during the day along with a lack of wind. This is more common later in October through mid March and becomes less persistent as the daylight hours increase through the Spring months. Here is another interesting fact concerning the days on end during the winter months when it is cloudy and damp outside during the winter. If you are one who enjoys hiking and the challenges associated with that in the winter months, once you rise above around 5000 feet in our region you will likely be greeted with a scene that looks something like the one below. 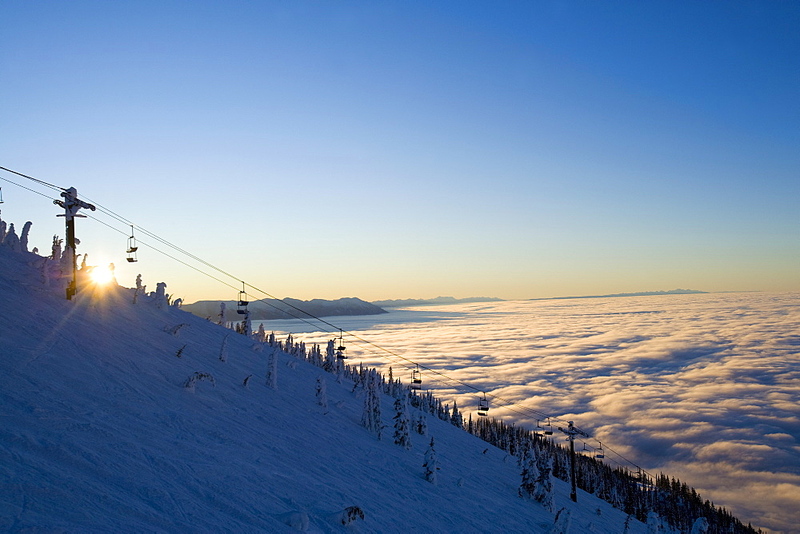 A picture taken at Big Mountain near Whitefish during the winter with clear skies above an extensive blanket of freezing fog and low clouds down below. This is common during the winter months when both upper level high pressure and surface high pressure are parked over our part of the country with clear skies in the mountains along with light winds in the valleys. The picture above is typical during stretches of upper level high pressure along with a surface high pressure area over our region during the winter months. In order for inversions to develop winds need to be light and skies generally clear. Once you rise above the top of the inversion layer, which for our part of the country typically occurs around 5000 feet, you most likely will encounter clear conditions above that elevation and cloudy, foggy and snow flurry conditions below that elevation. It is these same inversion conditions that often give our valleys here in Lincoln and Sanders Counties freezing rain when the pattern begins to break down and storm systems begin to move back into our region. The warmer temperatures aloft in the mountains cause snow levels and freezing levels to be rather high which means that any snow that falls into the warmer air above the inversion melts. Once it falls back into the cold air trapped in our valleys it will either re-freeze and fall as sleet or if the below freezing layer is less than 500 feet thick, will fall as freezing rain. It’s this cloud cover associated with the inversions that allow the little precipitation we receive in our area to soak into the ground, keeping the ground much wetter and thereby allowing the forests we have to flourish. During the summer months, those of you hiking in the mountains will notice that the nights are considerably warmer on slopes and ridges than down in valley locations. This too is due to inversion conditions although with summer being a drier time of year around here and the ground often dry along with much longer daylight hours, any low clouds or fog that do develop quickly dissipates to leave sunny skies. The final point here is that locations under the inversion will often be considerably colder, as much as 20 or more degrees colder than those in the “thermal belt” above the inversion. This can be very noticeable during the summer months when those of you who live on mountain sides and ridges will not cool off very effectively as those who live on the valley bottoms. This leads to uncomfortable sleeping conditions during periods of hot weather when the atmosphere does not cool off and remains hot. An example of this from the summer of 2018 near Libby occurred during the heatwave at the beginning of August when the high temperature was 108 degrees. On the valley floor the morning low that day was a very pleasant 50. At 500 feet above the valley floor the low temperature that same morning was 77 degrees, a whopping 27 degrees warmer! That is a strong inversion! Winds later that morning along with the long daylight hours of summer allowed the valley bottom to warm up and mix out with high temperatures being the same at both locations. So now when someone asks you about why it’s so cloudy in our beautiful part of the state you can tell them it’s the inversion. An inversion free day across south Libby in Lincoln County. The absence of low clouds and haze in the lower elevations indicates ventilation or rising air also evident by the cumulus clouds. This picture was taken during the late spring when inversion conditions are less persistent and less noticeable during the daylight hours. The first official day of summer arrives on June 21 this year for our region although we have been in meteorological summer since June 1. After a cool and wet start to our Spring and a very warm and dry end to it many are wondering what the summer looks like for our region. We are now officially into mid March as of this writing and the official start of Spring will occur next week on March 20th even though we have been in "meteorological spring since March 1st. Why the Relentless Western US ridge last summer? Many people have been asking why has it been so incredibly hot and in addition, dry? Many have wondered and asked about the heavy winter most of us in the Northwest part of the country including Northwest Montana and what exactly caused the winter of 2016-2017 to be one of the heavier ones? Below is the Climate Prediction Center's (CPC) 3 month outlook for the winter months of December, January and February for the country. 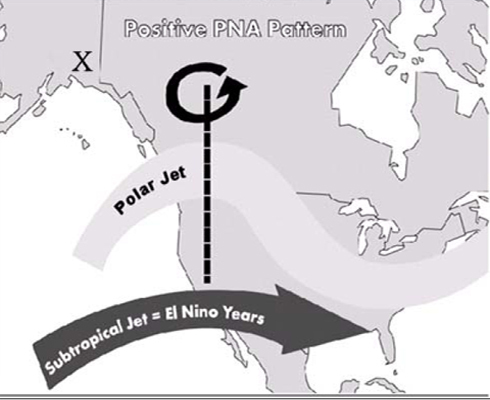 Every year around July, August and September we hear about the "Monsoon" and the favorite term used by many Western US meteorologists "Monsoon Moisture" to refer to our summertime outbreaks of Thunderstorms. Here we are at the end of November and it seems like it is Spring around here now that most of the snow has melted after our significant early season snowfall and all of the rain that has fallen the past two weeks.